Graceland Hotel Casino and Country Club Resort in Secunda, Mpumalanga, is perfect for any getaway. The resort’s theme is modelled after a colonial southern American mansion. Likewise, visitors can expect old world charm and hospitality. A part of the Peermont Resort Group, expect the highest quality in service. In the grandeur of the American South, visitors will find state-of-the-art casino facilities at Graceland Casino. They use a cashless gaming system, which ensures protection. They’ve created an environment comfortable for both experienced and novice gamers. Graceland Casino provides table rules, strategy cards, and how-to-play brochures. The casino has 310 slot machines and 18 gaming tables. These are all divided between the main casino (130 slots and 12 tables), the Horseshoe Casino (122 slots), and the Rockerfeller’s Prive (38 slots and 4 tables). Slot machines are accessible 24/7 while table games are open from 11:00 until late. Furthermore, the slots at Graceland are the latest in multi-line video slots with bets ranging between 1c to R50. Try your luck at either the progressive or fixed jackpot. Since this casino’s theme is the American south, the table games are American. Play American roulette, Arizona poker, Texas Hold’em poker, and blackjack. Players can find them in both the smoking and non-smoking areas. Rockerfeller’s Prive area is for the high roller player looking for exclusive treatment and entertainment. Located in a private mezzanine floor above the main casino, it also has a walk-in bar and lounge area. High-end functions and evens can also be hosted in Rockerfeller’s Prive. Visitors can join the Winners Circle, Peermont’s rewards programme. By signing up, visitors get an array of discounts and benefits. One such reward is getting points for playing at the casino. The luxury Peermont Walmont is Mpumalanga’s most elegant four-star hotel. Stay in the lap of extravagance in a room styled with the traditional Victorian-American theme all around the casino and resort. Each of the 98 rooms have modern amenities such as free WiFi, satellite TV, and 24-hour room service. Enjoy a panoramic view of the golf course or pool terrace from the comfort of your bed. 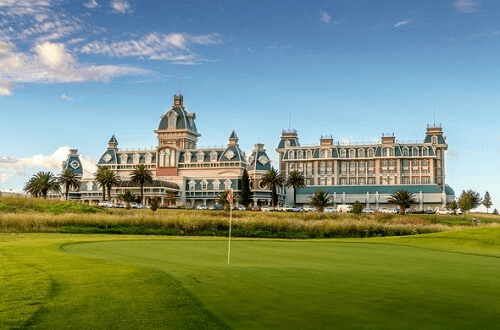 For golf-enthusiasts, the Gary Player designed 18-hole championship golf course is a major attraction. It makes use of flat savannahs, significant elevation changes, water hazards, rolling fairways, and a strategically placed bunker. Visitors can take advantage of the weekday golf special on Tuesdays and Thursdays. In terms of dining, Graceland has something for everyone. The Augusta Club Lounge is the perfect spot to unwind after a day out on the golf course. It’s decorated with golfing memorabilia found locally and abroad. Enjoy drinks and a light meal looking out onto the course. Sticking with the American south theme, the Blue Bayou is a New Orleans themed restaurant. It serves meals inspired by different cuisines from around the world, with both menu and buffet dining. Madison’s Bistro is a trip to NYC with loft-style dining for the whole family. Enjoy American cuisine while overlooking the main casino floor. The Palm Terrace Snack Bar offers visitors light meals and refreshments at a self-service bar. It’s located by the pool area and golf course. Those looking for a fun and trendy night out must head to Moo Bar. Experience Americana in all its glory while enjoying cocktails, sports matches, and live entertainment. Recently opened, Thunder Valley is an exciting 310m go-kart track. It’s a great place to go if visitors are looking for adrenaline pumping action for the whole family. After all that excitement, a beauty treatment at the Rootz spa will help guests relax and unwind. Located inside the Peermont Walmont, visitors are greeted with a cup of herbal tea. Graceland Hotel Casino and Country Club Resort covers all the bases that makes a perfect weekend retreat. 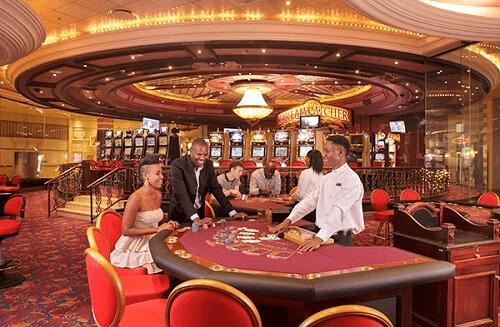 For more on casinos in Mpumalanga, read our guide at CasinoZA.